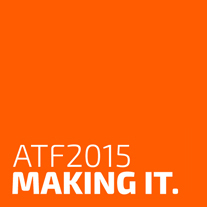 ATF 2015: MAKING IT was held at the Seymour Centre in Sydney from 20-23 January 2015, as part of Sydney Festival. You can read the Program Overview and a note from ATF Curator David Williams. January is Sydney’s busiest time of year and 2015 even more so with visitors to Sydney for the Asian Cup. So you’ll need to have booked by now, for travel, accommodation and Sydney Festival shows. Whilst in Sydney, you may wish to hold your own meeting outside the main event or host a networking function to engage with industry associates and potential clients. AccessNSW, a complimentary service provided by Business Events Sydney can assist you in providing qualified independent choices on the best venues, accommodation and conference suppliers for your event needs. Visit Business Events Sydney for further information.